We decided to do a same kit build this year in our club (NorthCoast Auto Modelers) and everyone picked the bronco as the kit. For some reason, the low rear wheelwells on the early broncos make me think of 50s customs. I decided to fully embrace this, and make a bronco convertible lead sled. 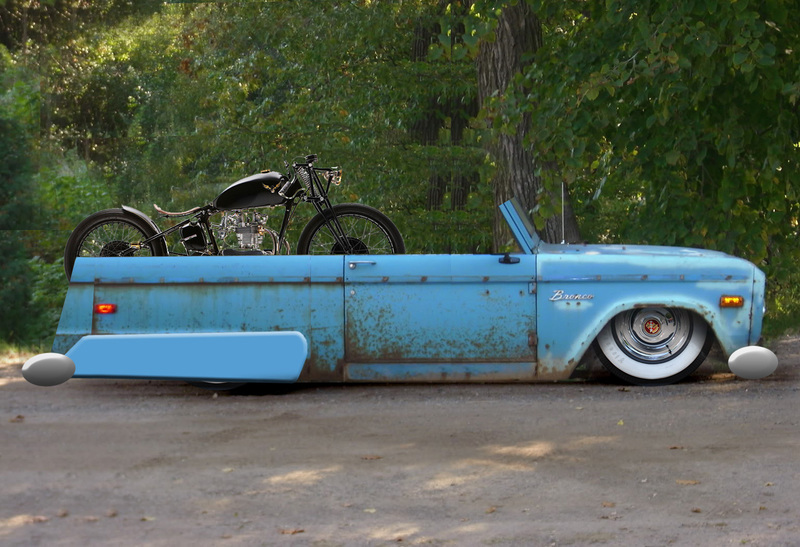 Here is a somewhat crude photoshop of whats going on in my head on this one (not the color and patina.. actually thinking a baremetal body). So first things first it needed to be a bit longer. so i had to buy 2 kits... and combine them. Added about 5/8"behind the door opening... and about 1/4" to the door to get the proportions all to work. 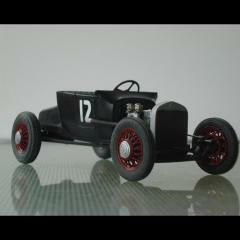 then i needed to tackle the angle back... so i used the front fenders from the scrap body. working on finishing off the slantback with the extra hood... hopefully that happens tonight. You have a sick mind, Eric. And I like it! This is gonna be fun to watch! Pretty cool idea. The skirts don't look quite right to me but can't put my finger on why. I am probably alone on that . This will be very cool in any event. Wow. Great idea. Gonna be fun to watch. First off, I like this project. Very original and cool. But, the skirts as the are, stick out like a sore thumb, in my opinion. The rear wheel well opening helps form a very clean body line. A shame to lose that. 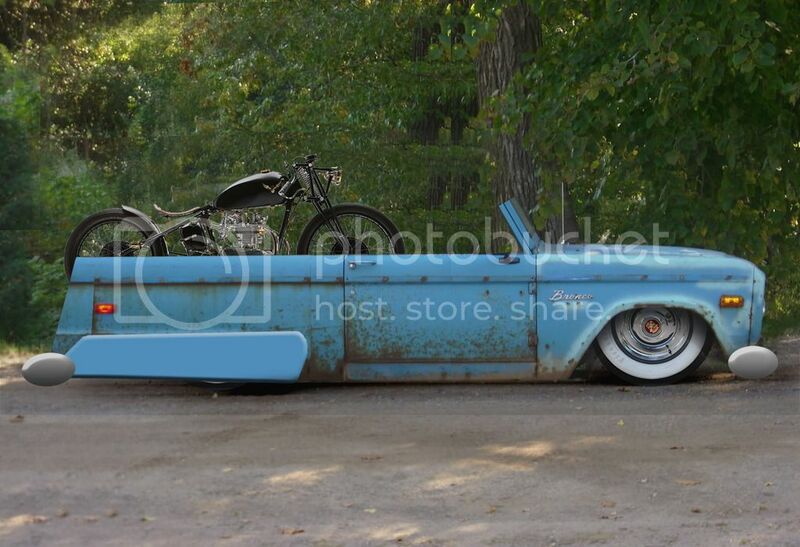 Maybe consider just a skirt that fits the wheel opening or something like the '58 Impala skirts. The piece of sheet stock doesn't really have much character, it's just flat. 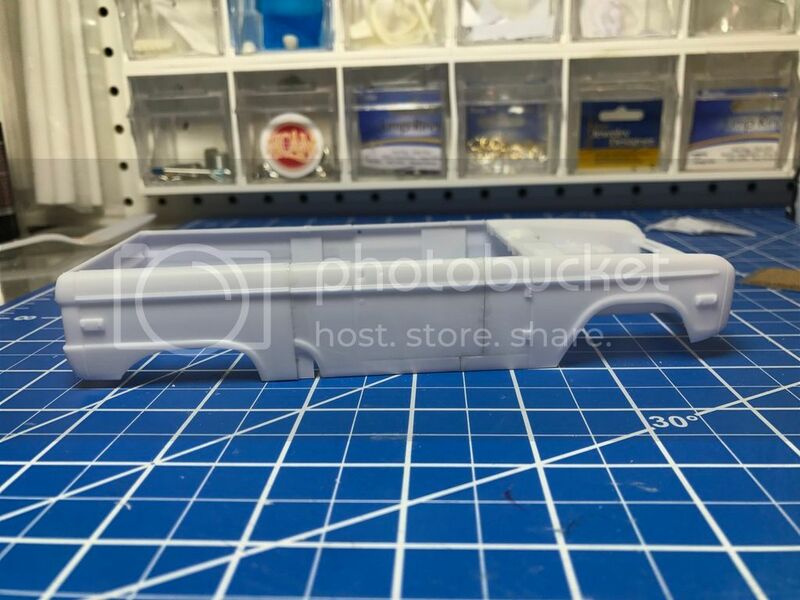 Maybe add a character line to with some half round stock? My $.02. Look forward to watching you knock out another unique build. Are you going to build the bike ? The hood for the tailgate is a very clever idea. I like the look of the angled rear end. Thanks guys! its going to be a fun one..
Yeah.. the plan is to scratchbuild the bike.. my current plan is to use a hopped up ModelA Flathead 4cyl in the bike, and Flathead v8 in the bronco... subject to change, but seems like it could be fun. Thanks Rob! I agree the skirts aren't 100% there yet.. Im still going to add some trim and some other detail to them. Here is a bit of progress from the weekend.. although not a ton... I did get the tailgate fitted and blended. The center cutout will be for the bike to roll up, the continental kit will fold down to make the bike ramp and fill that area up visually. Very slick my friend.But then I was expecting nothing less from your creative mind! You nutter. This thing is awesome! I think the skirts could maybe use a larger radius on their top edge, or perhaps more pronounced roll-under like the original rocker panels. And chopping up two new kits, too. Sounds excellent to me. looking forward to it. How are you going to modify the suspension to lower it? Thanks guys!!! im not getting much done on this... so updates will be sporadic... but oh well its spring/summer. Im going to just make my own new frame from styrene rod and square tube... Ive been wanting to make something with cantilevered airbag suspension, so i figured this might as well be the one... I want to try and keep the interior somewhat skeletal on each side of the bike, so you can see the rear suspension. I need to cut the inner fender wells out of the front, then make body mounts.. then i can start working on the frame design. Whoa. That's way above my level. I was asking because I'm building a Bronco and I want it low with wide tires. Not as low as yours though. Going to be fun watching you do the chassis. Thanks guys! i am having fun with this one... slow progress but fun! I managed to cut out the inner fenders and make some wide whites fit. just in case anyone was wondering (lol) you can take 1/4inch out of the foose FD-100 Grille and it fits the bronco like a glove! 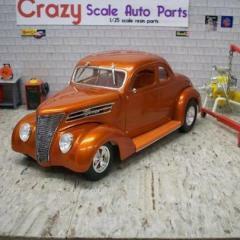 Now i have to figure out what to do with this foose truck without a grille, guess that will be a future project..haha.. I think im going to use this old amt 1958 impala front bumper.. it seems to have just the right amount of character and wrap around. just needs some reshaping and to be a bit narrower. I like that '58 Impala bumper for those same reasons - stylish wraparound and you can narrow them at the 1:1 factory seams. Thumbs up. Nice choices. The front is going to look great.